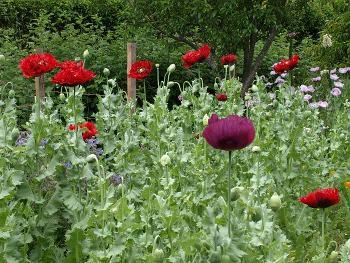 (Opium poppy) Source of opium and the narcotic alkaloids, morphine and codeine, used to control pain, coughs and diarrhea. The plant is far more important for its culinary uses. Its seeds, which do not contain alkaloids, are widely used on breads, cakes, bagels and in Middle Eastern delicacies. The seeds also yields a good quality oil used for salads, soap, ointments and paints. A beautiful cool season annual with a mixture of single and double flowers in a riot of colours from pink to purple but most are blood red.